Happy Tuesday ladies! I hope everyone had a fabulous long weekend. Ours was wonderful - more to come on that tomorrow, though! 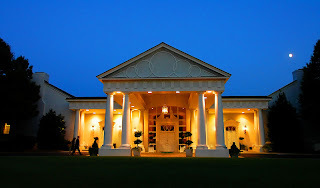 Today for Bridal Talk Tuesday I want to showcase our reception venue. I've showed a few pictures of our venue before but it hasn't had its own post yet. 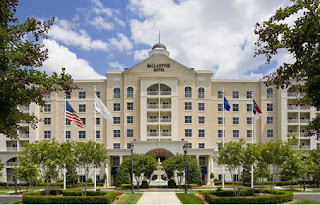 Our reception will take place in the grand ballroom of Ballantyne Resort Hotel in Charlotte, North Carolina. Let's take a little tour of the venue. Ballantyne Resort Hotel - situated in the Ballantyne area of Charlotte, Ballantyne Resort Hotel is easily accessible to all our guests. It sits on an 18 hole golf course so the male guests will have plenty to do while the ladies are at the spa. 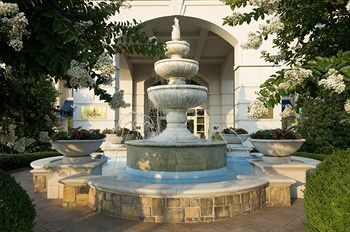 What a beautiful fountain for guests staying at the hotel to enjoy as they check in. Also a fabulous spot for wedding day pictures. Pretty lobby. 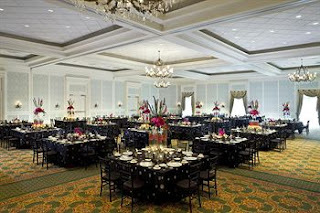 We wanted our reception in a hotel ballroom because so many of our guests will be joining us from out of town. We have rooms reserved both at the Ballantyne and at another hotel across the street. 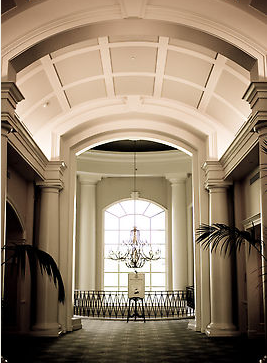 The ballroom has its own private entrance. 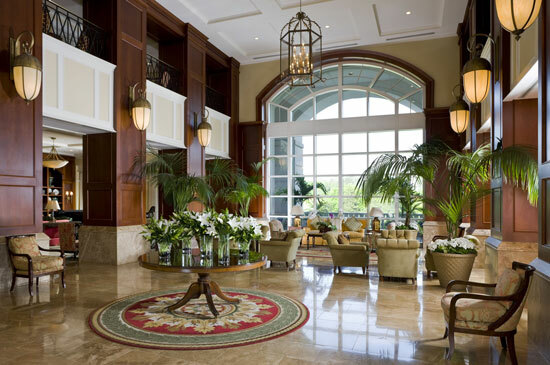 This makes our reception easy for our guests to find, keeps chaos out of the main lobby area, and most importantly - discourages others from wandering into our reception. Entrance corridor by the ballroom. Guests will enter here then make their way down the grand staircase. Don't you love the chandelier? Its hard to tell from this photo but it is huge! And absolutely gorgeous. I love this staircase! It will be another great photo-taking spot. 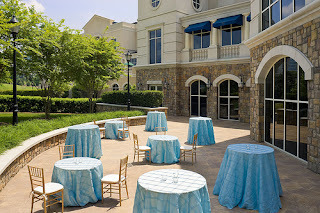 Our cocktail hour will be indoor/outdoor at the base of the staircase as well as on the patio outside by the golf course. I love the classic ballroom. I love the chandeliers and wall sconces. My favorite thing about this ballroom is what a classic, elegant feel it has to it while still being very modern with lighting and technology. We'll be using mostly round tables and gold chiavari chairs. While we want to play up the timeless elegance of the ballroom, it is possible to do almost anything with this room. Wall draperies and uplighting are available. 1.) Great communication from the event staff. 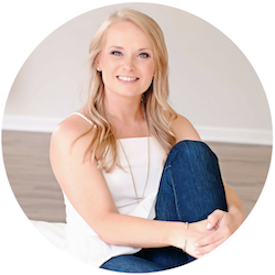 This was so important - our second choice venue had terrible, terrible communication and I sure don't want those kinds of problems during the week of or day of our wedding. 2.) Aesthetics. Obviously we wanted a beautiful sight that paralleled our "vision" of classic elegance. 3.) The Ballantyne has SO many weddings every year. 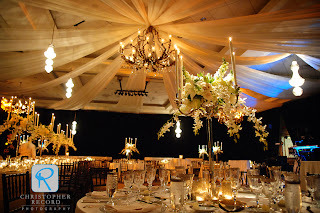 They are very experienced with weddings and have a reputation of doing a great job. There was a very long waiting list to get a wedding date at the hotel. 4.) The staff has worked with our wedding planners before and have a great professional relationship with them. This is so important. 5.) On-site catering. We really wanted a venue that does their own catering as this is much less stressful. But, we wanted on-site catering that would be good. Our photographers said some of the best food they've ever had has been at our venue - and they've had lots of wedding meals! 6.) We wanted a reception site inside a hotel so that we could offer room blocks to out of town guests and provide easy and efficient transportation to the ceremony for them. The Ballantyne has plenty of guest rooms but is also within walking distance of three other hotels so we can offer guests several options. 7.) Flexibility and Professionalism. We've gotten this every step of the way. 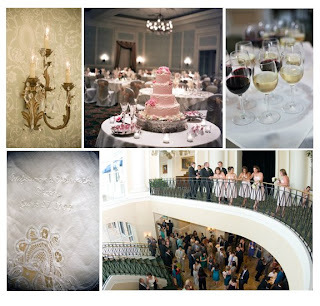 The staff is wonderful and the wedding policies are very conducive to what we want. 8.) 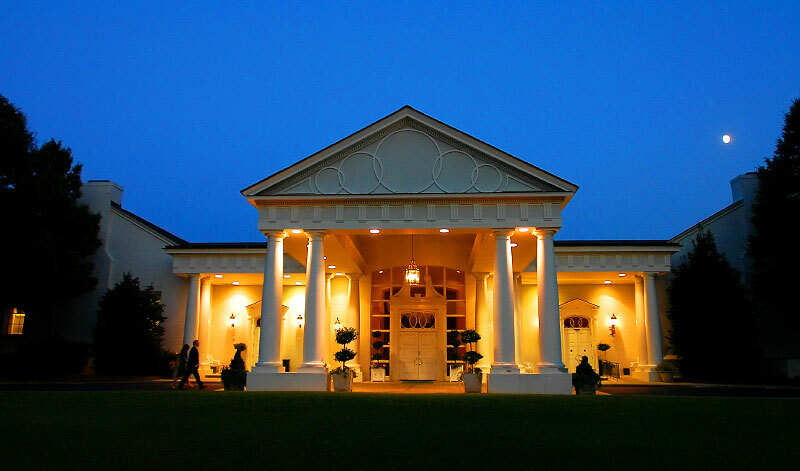 The most important aspect to choosing our venue was that it just felt right. 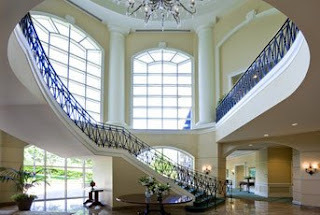 When Corey and I went to visit the Ballantyne, we could see ourselves partying the night away there. 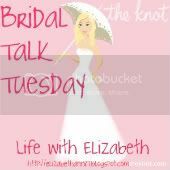 Want to join in on the Bridal Talk? Link up below! Wow! 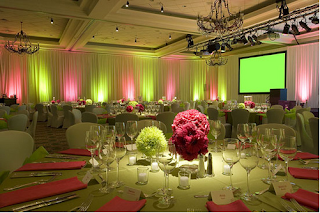 Looks like your wedding reception will be gorgeous! That is so absolutely stunning! What a great venue - you are very lucky!! That is close to my dad's house!!! It is so beautiful :) congrats!! This is so beautiful! It will be perfect for your big day!